KK OUTLET UNVEILS GILES DULEY’S LATEST AFGHANISTAN PHOTOGRAPHY SERIES, AS HE RETURNS TO THE COUNTRY WHERE NEARLY LOST HIS LIFE. 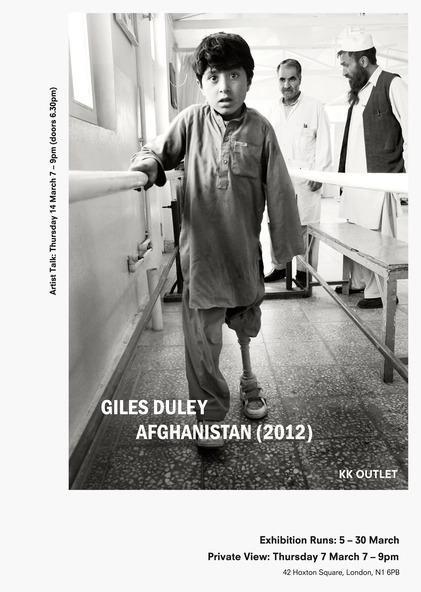 Whilst embedded with the US army in Afghanistan, British humanitarian photographer Giles Duley stepped on an IED. The explosion left him with horrific injuries and ultimately, a triple amputee. 18 months after sustaining injuries that meant he hovered between and life and death, he kept the promise he made to himself the day of the incident: To return to Afghanistan to complete his work documenting the impact of the invasion on civilians. In October 2012 Duley returned to the country where he very nearly lost his life and undertook his first major photographic assignment since the explosion. KK Outlet will showcase this new series in an exhibition which runs throughout March.